Chandra's image of the Galactic Center (left) has provided evidence for a new and unexpected way for stars to form. A combination of infrared and X-ray observations indicates that a surplus of massive stars has formed from a large disk of gas around Sagittarius A*, the Milky Way's central black hole (illustration on right). According to the standard model for star formation, gas clouds from which stars form should have been ripped apart by tidal forces from the supermassive black hole. Evidently, the gravity of a dense disk of gas around Sagittarius A* offsets the tidal forces and allows stars to form. The tug-of-war between the black hole's tidal forces and the gravity of the disk has also favored the formation of a much higher proportion of massive stars than normal. This novel mode of star formation may solve several mysteries about supermassive black holes that reside at the centers of nearly all galaxies. When the massive stars explode as supernovas, they will enrich the central region's galaxies with heavy elements such as oxygen and iron. This may explain the large amounts of such elements observed in the disks of supermassive black holes. Another possibility is that the massive stars around Sagittarius A* could have formed in a cluster far away from the black hole and migrated inward. A large number of low-mass stars would be expected to form in association with the massive stars - the migration model predicts that about a million low-mass stars should have migrated to the Galactic Center along with the massive stars. Chandra observations of the Galactic Center show that the expected low-mass stars are not there. 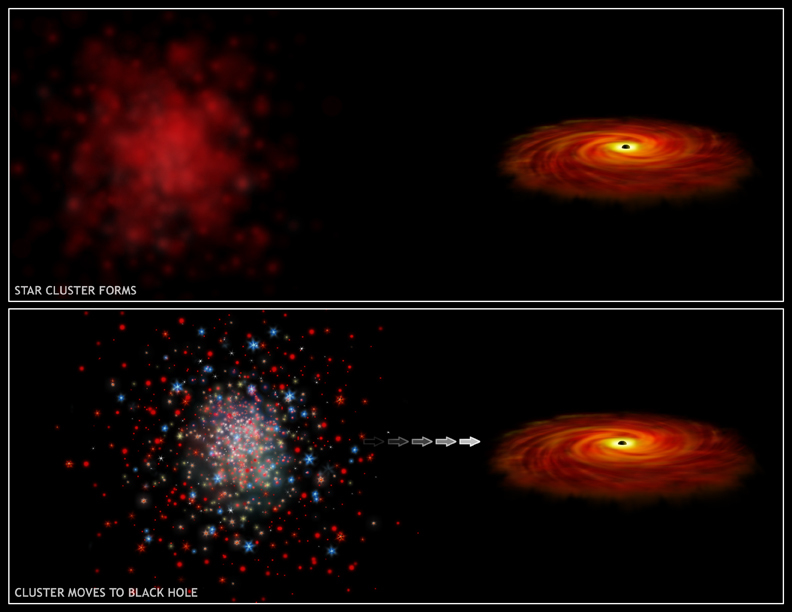 The conclusion is that the massive stars must have formed where we see them now - around the black hole. Scale Left panel is 5.6 arcminacross. References S. Nayakshin and R. Sunyaev, 2005, MNRAS, in press.